Kent Scientific Services, a Public Analyst Laboratory, selected a Stuart STR4 rotator to meet the requirements of its fertiliser enforcement analysis work. The prescribed analysis methods for checking the nitrogen and phosphorus content in fertiliser samples require flasks to be mixed end-over-end at 35-40rpm, faster than many other rotators can achieve. Nitrogen (N), Phosphorus (P) and Potassium (K) are the three primary nutrients needed in large quantities by plants. Manufactured fertilisers, used to supply crops with nutrients the soil lacks, have to be labelled with three figures indicating their NPK content. The Fertilisers (Sampling and Analysis) Regulations 1996 require the figures to be checked by standardised analysis techniques. Kent Scientific Services, one of 18 Public Analyst Laboratories in England, provides scientific and calibration services for local authority enforcement agencies, including analysis of fertiliser samples collected by local Trading Standards officers from manufacturers' premises or at the point of sale. David Heath, Quality Manager/Toxicology Manager at Kent Scientific Services, commented on the role played by the Stuart STR4 rotator in the laboratory's fertiliser analysis work: "When our old rotator broke down we needed to find a new one capable of providing the rotation speed specified by the regulations. The prescribed analysis methods for soluble N and P require fertiliser samples to be mixed with 400ml of water in a volumetric flask and mixed by end-over-end rotation at 35-40rpm. The speed we needed was well within the range offered by the STR4. The Bibby Scientific engineering department were very helpful to us, adjusting the bracket on the rotator so that it would work with the large 500ml flasks we need to use. They also extended the length of the bar so that we can mix four rather than two 500ml flasks at once, enabling a control to be processed alongside three samples.The STR4 incorporates a useful timer, which we set in order to mix the fertiliser samples for precisely 30 minutes, as specified in the regulations." 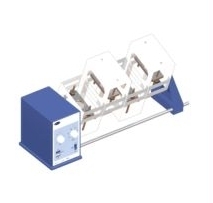 The Stuart STR4 drive unit is highly versatile, accepting a choice of five drums designed to take test-tube holders, plates, racks of microcentrifuge tubes, conical flasks, reagent bottles, or jars and paint tins up to 200mm in length and 120mm diameter. The rotation speed is variable from 6 to 60rpm for a range of mixing applications, and the unit can be run in continuous operation mode or with the analogue timer set for 10 to 60 minutes.